For the second year running, Geek Pride were given the opportunity to attend Wales Comic Con at Glyndwr University in Wrexham, North Wales. Whilst it may not be quite as widely known as the likes of the London and Manchester events, it’s fast becoming one of my favourite UK conventions in the calendar. 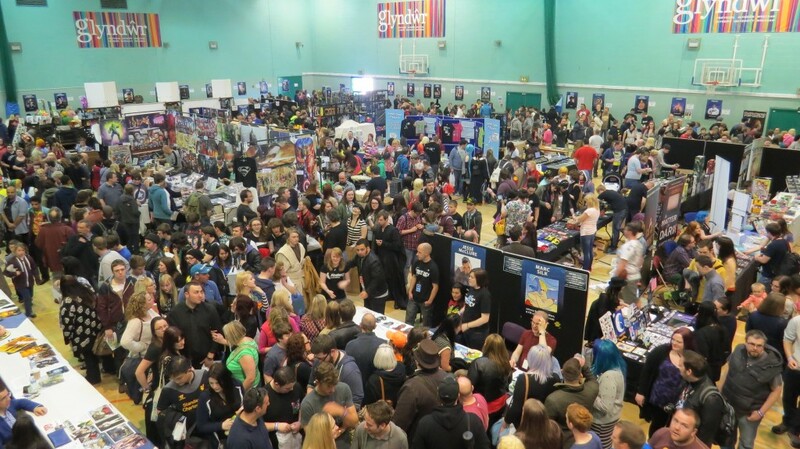 Now in it’s seventh year, Wales Comic Con has grown from a small event seeing a few hundred like minded folk at the venue to a hugely popular convention that welcomed thousands through it’s doors. This year, being my third at the event, really upped the game in my mind and was a great experience to be a part of. As we arrived at the venue, we were greeted by the familiar gigantic queues at the doors, waiting for them to open. Like many events, Wales Comic Con offers an early bird ticket, allowing entry from 10am rather than the 11am general entry, which really is a must for any fans that don’t want to be waiting outside for a long period of time. Since Geek Pride are super awesome and we were on the press list, we were able to walk straight through to the press area and were even allowed access before the doors opened, which was a really interesting experience. As expected with any convention, the main hall is always absolutely jam-packed, although I do applaud the organisers this year on spacing things out more and moving the entrance away from the hall to avoid a rush as people get inside. Walking into the main hall, which was empty apart from the arriving guests and their event assistants, was a weird, but very cool, experience. 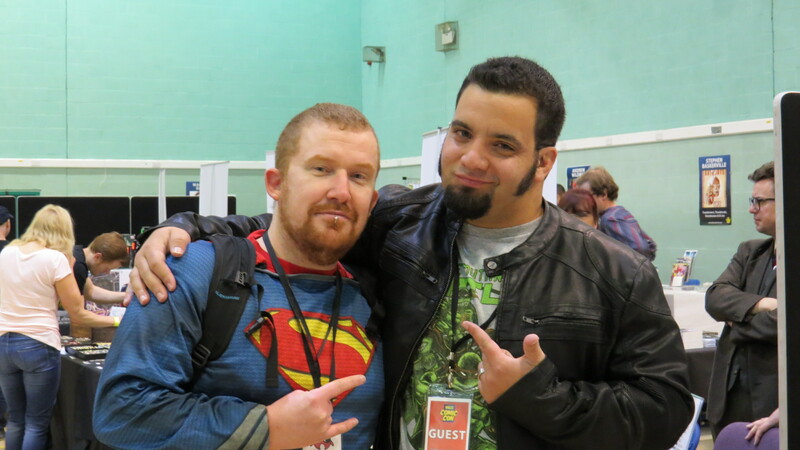 As soon as we got inside we bumped into an almost bemused Jesse McClure, star of Amercian TV show, Storage Hunters. Jesse was an absolutely lovely guy and was more than happy for a quick interview, which will be up on the website over the next few days. We then turned around to spot friendly convention favourite Mark Addy, who you’ll hear more about in my Game of Thrones interview later this week. That’s right, I’ve got an awful lot of transcribing to get on with. Over the past few years, the event has had some fantastic guests on offer. Being a massive Buffy dork when I as younger, some of my favourites in the past have been Anthony Stewart Head in 2012 and Nicholas Brendon last year, along with many of the Game of Thrones and comic artists at the event. This year did certainly not disappoint, with a huge variety of guests on offer from TV, film, wrestling and the comic universe. I felt that the organisers excelled this year in particular with the comic artists that appeared at the event, which is always one of the highlights for me. Some of my favourites at the weekend include the lovely Neil Edwards, Andrew Wildman, Stephen Baskerville, Liam Shalloo, Lee Townsend, Henry Davies and John-Paul Bove. I’m aware that’s quite a list, but all of these guys really were great and very kindly took the time for a chat and even to sketch for us – more on that later. However, my biggest highlight at the event was getting to meet and interview the fantastic Charlie Adlard, artist for The Walking Dead comic series created by Robert Kirkman. Neil Edwards sketching for us. Adlard’s appearance at the event was the one I was most looking forward to and I was filled to the brim with fangirl excitement after I got in touch with him an arranged an interview for over the weekend. I’m a huge fan of The Walking Dead and Adlard’s artwork in particular and there’s no doubt that he was the most popular guest at the event. Offering autographs for free and original sketches for only £10, which would be donated to charity, Adlard’s queue was most definitely the biggest I’ve seen at Wales Comic Con over the past three years. Eventually, the organisers had to actually start giving out tickets for folk to join the queue once their number was called out. I’ll refrain from babbling on about him for now, make sure to check out my full interview with him on the website over the next few days. An unusual request – Howard the Duck in Rick’s hat. 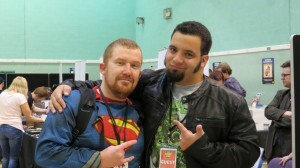 Along with the excellent artists on offer, Wales Comic Con hosted quite a variety of stars from film and TV. From Game of Thrones, Red Dwarf, Battlestar Galactica and Atlantis regulars to stars of The Hobbit, Lost Girl, Harry Potter and much more. Some of the bigger names there included Kenny Baker (R2D2! ), Warwick Davis, Alison Mack of Smallville and TV favourite, Jonathan Ross. Make sure to check back later in the week with my Game of Thrones cast interview and coverage of the An Audience with Jonathan Ross Q&A. Many of the guests were involved in photo shoots as well as Q&As, which as always, were incredibly popular. There were also wrestling legends on offer, including the hilarious Rikishi, who’s cheeky grin and shouting ‘hey girls, I see you smiling at me’ left us in a fit of nervous giggles. Marc Silk, who refers to himself as the ‘voice guy’ is always a familiar guest and another that was absolutely charming to talk to. Silk is most known for his work on Johnny Bravo, Scooby Doo and with Disney, but the list really is endless. In fact, the only guest that it wasn’t a pleasure to meet was wrestling ‘legend’ Vader, the only person to shun our calendar because he apparently doesn’t agree with donating to charity. It’s not all about the guests though and there were plenty of other things going on to keep folk occupied. An Owl Santuary, Gaming Bus, car displays and wrestling ring were all found outside which offered a chance to get away from the ever busy main hall. 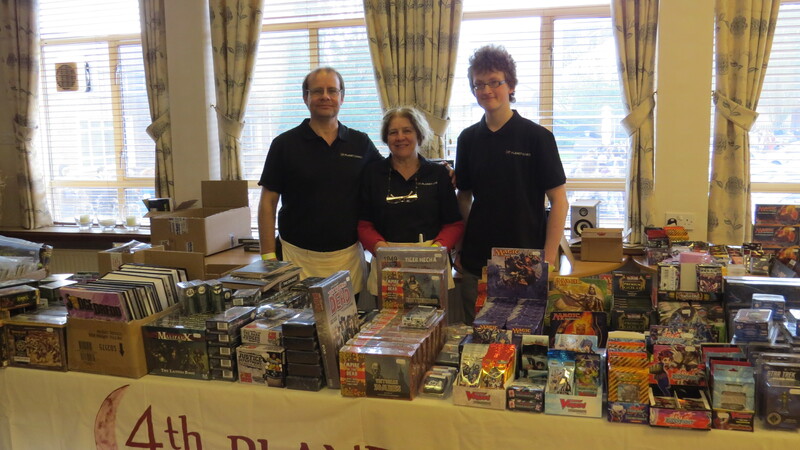 A great selection of stalls were on offer this year with all sorts for sale such as comic books, memorabilia, clothing, jewellery and table top games. We caught up with Wrexham store 4th Planet Games before the event kicked off who had set up a table-top gaming area to offer attendees the opportunity to purchase games and then play them straight away. The shop is relatively new and this was their first convention, but they seemed busy enough later in the day! As as expected, cosplay was extremely popular at the event and I was rather disappointed that I had opted out this year. However, after spending all day in a Totoro Kigurumi last year in the rather warm main hall, I was rather glad that I had decided against it. This year, people had finally started moving away from the typical Harley and Joker costumes to something rather different. A popular theme at the event was Frozen, with several Anna and Elsa pairs wandering around. The Alien Loves Predator duo returned and some of my other favourites included a very cute little Link, Jon Snow & Ygritte and the puppet from the Saw franchise. That guy was so dedicated that at one point in the afternoon we spotted him in a queue for the burger van, still sitting on his tricycle. Make sure to check out our full gallery on Facebook! 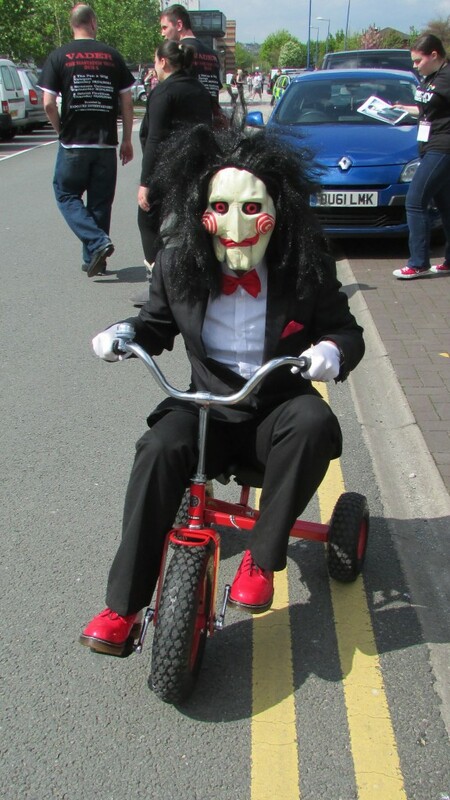 Overall, Wales Comic Con 2014 really was excellently organised and I felt that everyone was very accommodating with us. One thing that I would like to see in the future is more guests donating their autograph and photograph fees to charity, which a couple of people were doing this year. Charlie Adlard’s £10 donation for an original sketch, which covered everything from zombie wedding photos to Superman and Howard the Duck, was such an amazing bargain and I’m hoping that he’s set a trend. Adlard, along with Jonathan Ross, were signing for free and had both commented that they did not feel guests should charge for autographs. However, I certainly wouldn’t mind parting with the cash if I knew it was going to a good cause, so it would be great to see that take off over the next couple of years. Now, you might remember that towards the end of 2013 the Geek Pride team got together to shoot a Charity Cosplay Calendar to raise money for Cancer Research UK. The calendar was shot at a studio in Manchester by Geek Pride overlord, Matt Geary and sold online to the lovely people that donated money. Well, I wanted to take something with me to Wales Comic Con that I could try and get signed in order to auction off to raise more money for the charity and what better than a copy of our fabulous calendar. Now, I wasn’t too hopeful with this but I thought that we could get at least a few people on board to autograph the cover for me. I was completely overwhelmed with what happened when I took the calendar with me on Sunday. I began by explaining my plan and asking comic artist, Neil Edwards (Marvel & DC), if he would sign the front for me. 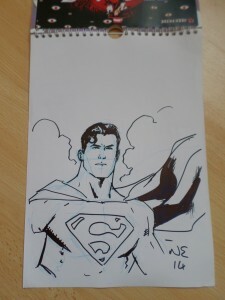 Instead, Neil opened the calendar and began sketching Superman on the first page whilst I stared open-mouthed in awe. 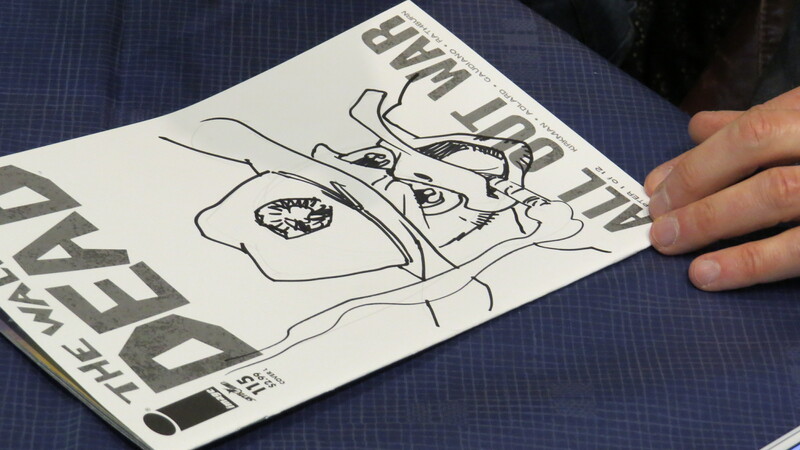 This really set a trend which saw Charlie Adlard, Stephen Baskerville, Lee Townsend, Andrew Wildman, Liam Shalloo and Henry Davies also sketching for us. Not only that, but we got plenty more autographs on the front from other artists, Game of Thrones cast members, Kenny Baker, Marc Silk, Rikishi, Jesse McClure and Norman Lovett. I’d like to thank everyone that took part in signing or sketching for the calendar, as well as helping to share it on Facebook and Twitter. 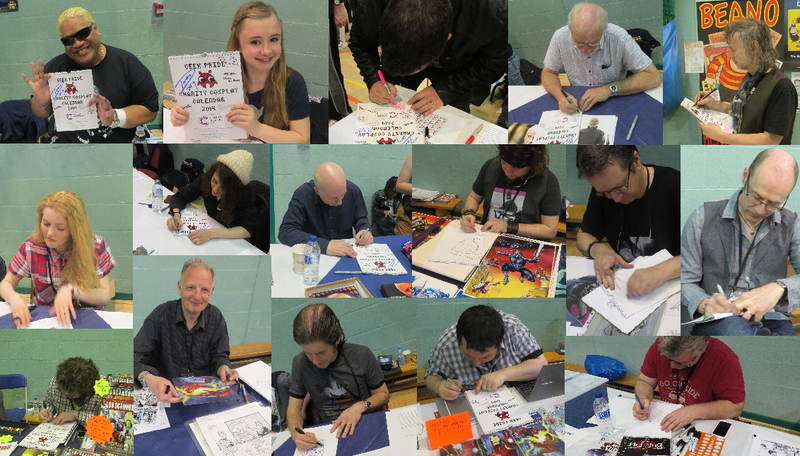 So far I’ve had Charlie Adlard, John-Paul Bove and Liam Shalloo help spread the word, along with friends and supporters of Geek Pride. The calendar is now being auctioned on eBay with 100% of the sale going to charity; 75% will go to our original charity Cancer Research UK, with the remaining 25% going to The Sophie Lancaster Foundation as a thank you to my cameraman for helping to achieve this, with him being a supporter of the charity. Please help by spreading the word or even putting a cheeky bid on the calendar! It has 20 autographs/sketches and images of each sketch can be found on the listing. 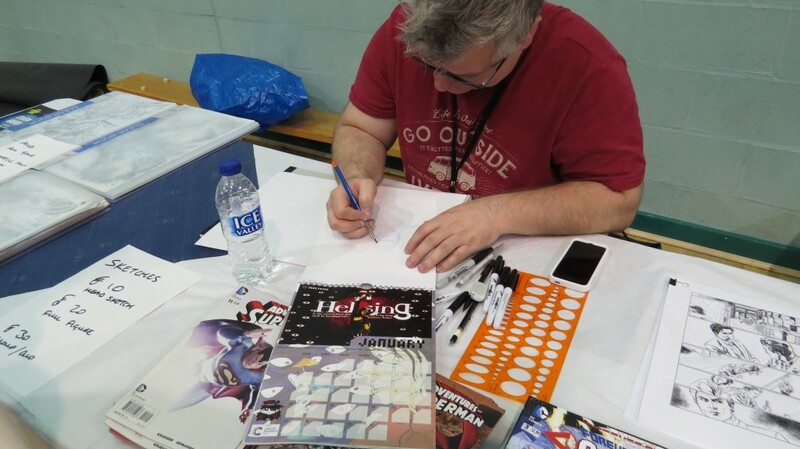 So, that’s my rather lengthy Wales Comic Con 2014 round-up and now it’s time for me to get transcribing the eighteen recordings I have from the event. Look out for upcoming interviews with Charlie Adlard, Jesse McClure, Game of Thrones cast (Mark Addy, Ellie Kendrick, Kerry Ingram, Aimee Richardson and Ian McElhinney) and plenty of comic artists. Also, check out our Facebook page for more photos from throughout the day!